(1838-1911) William Keith was born in Aberdeen, Scotland in 1838. In 1850 Keith immigrated with his family to New York and then to San Francisco in 1859. Keith became interested in painting and first studied with Samuel Brookes. In 1872, Keith met naturalist John Muir who took him into the most remote parts of Yosemite, thoroughly acquainted him with nature’s wonders. Keith moved to Berkeley into a home at 2207 Atherton where he was to live until his demise in 1911. His oeuvre can generally be divided into two periods: his early works are often mountain epics in descriptive realism as espoused by the Dusseldorf School; whereas, his later paintings are more closely akin to those of the Barbizon painters. His later paintings are darker, smaller and more intimate with emphasis on mood. 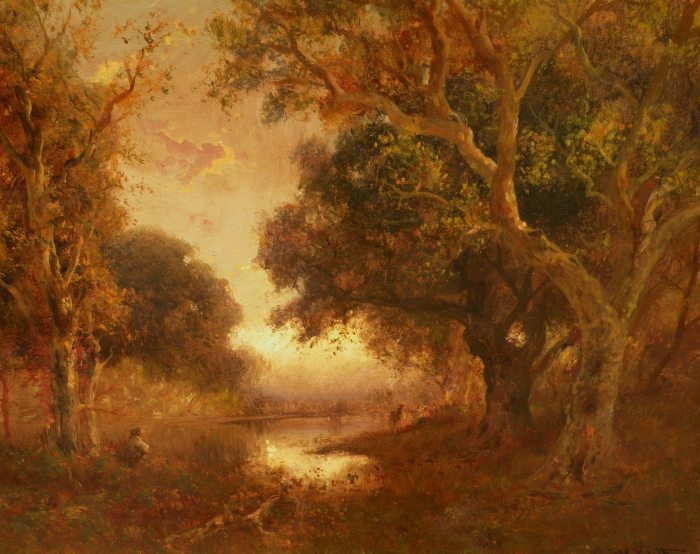 Keith commuted daily by ferry to his San Francisco studio and many of his works are pastoral landscapes of Berkeley with oak trees, cows, and ponds which he sketched en route. He painted nearly 4000 oil paintings of which 2000 burned in the fire of 1906. The women artists who studied under Keith are many; he seldom took male pupils. He has been called “Dean of California Artists” and “California Old Master.” An entire room was devoted to his work at the Pan Pacific International Expo of 1915 and the Keith Gallery was open in 1934 at St. Mary’s College in Moraga. Works held: Crocker Museum; Oakland Museum; Metropolitan Museum; Bohemian Club; de Young Museum; California State Capitol.